Everyone says that Caro is bad . . . but Jamie can’t help himself. He thinks of her night and day and can’t believe that she wants to be his girlfriend. Gorgeous, impulsive and unconventional, she is totally different to all the other girls he knows. His sister, Martha, hates her. Jamie doesn’t know why, but there’s no way he’s going to take any notice of her warnings to stay away from Caro. But as Jamie falls deeper and deeper under her spell, he realises there is more to Caro – much more. There are the times when she disappears and doesn’t get in touch, the small scars on her wrists, her talk about revolutions and taking action, not to mention the rumours he hears about the other men in her life. And then always in the background there is Rob, Jamie’s older brother, back from Afghanistan and traumatised after having his leg smashed to bits there. Jamie wants to help him, but Rob seems to be living in a world of his own and is increasingly difficult to reach. With Caro, the summer should have been perfect . . . but that isn’t how things work out in real life, and Jamie is going to find out the hard way. 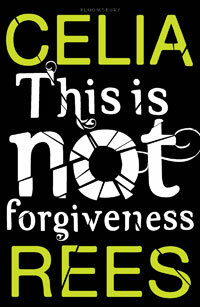 This taut psychological drama is the brilliant new novel from acclaimed Celia Rees. This Is Not Forgiveness is the first book I've read by Celia Rees so although I've been told it is very different to her usual books I can't make any comparison. The story is mainly told by Jamie with occasional chapters from his brother Rob or his girlfriend Caro's perspective. I've seen some people say that they found the switches in narrators confusing but I have to say I felt the author gave each character such a clear voice that I didn't have a problem keeping track of who was narrating at any one time. I think you actually needed all three characters to tell a portion of the story, if you hadn't got to know each of them quite so well then it would have been very hard to empathise with any of them - Rob and Caro in particular. That isn't to say I agree with what they were up to but seeing inside their heads at least gives you more of an idea how they ended up where they did. It's been a long time since I disliked a character as much as I did Caro. You do get to see that she hasn't had the best upbringing but really there are a lot of people out there who have had things a lot worse than she has and don't turn out so selfish and uncaring. To a certain extent she has also been manipulated by the crowd that she falls in with who prey on her as a young, idealistic girl but I still found it hard to forgive her actions and wasn't happy with the secrets Jamie kept at the end (I can't say more about that without giving spoilers). Although I didn't like her even a tiny bit she did manage to surprise me at the end of the book - I never would have expected her to act in the way she did and that did go a little way towards redeeming her character for me. Rob has returned from the army a broken man but although physically injured it is the emotional scars that have the strongest impact. The things that he has both seen and done have left their mark on him and it was quite disturbing to see how little help he had trying to adjust to civilian life. The more you learn about him and the way he acted even as a child the more you start to see that his problems didn't begin in the army though. I was actually left thinking that he probably should never have been allowed to sign up in the first place and that training him to use a gun wasn't really the best thing for him. Jamie was completely different to his brother and has a very naive outlook on things. He was far too trusting and when it came to Caro he was easily manipulated into doing whatever she wanted. No matter how badly she treated him he kept coming back for more and while I can remember doing stupid things in the name of love as a teenage as an adult I find it hard to empathise with someone who is so weak willed. I felt sorry for Jamie but I spent a lot of time feeling incredible frustrated with him for not walking away from Caro while he had the chance. The story is hard hitting and raises some interesting questions, it isn't a comfortable read but it is an interesting one. If you're looking for a YA book with a political edge to it that will make you think then I would definitely recommend This Is Not Forgiveness.